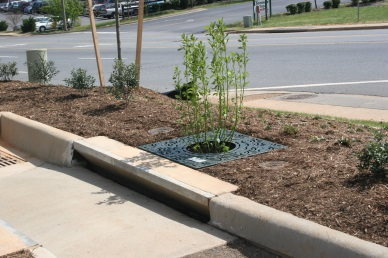 Filterra is similar to bioretention in its function and application, but has been optimized for high volume/flow treatment and high pollutant removal. 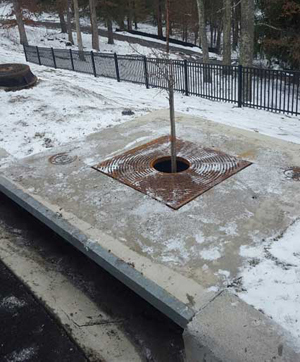 Its small footprint allows it to be used on highly developed sites such as landscaped areas, parking lots and streetscapes. 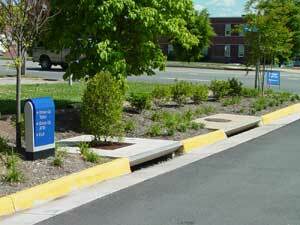 Filterra is exceedingly adaptable and can be used alone or in combination with other BMPs. 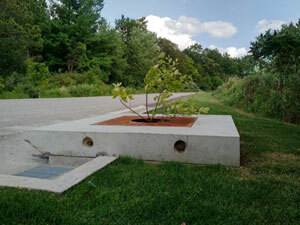 The Filterra® Bioretention System has been verified in accordance with ISO 14034 Environmental Management - Environmental Technology Verification (ETV). 1. 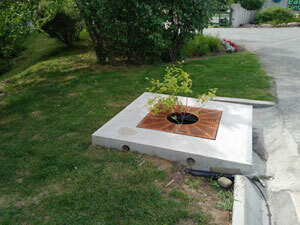 Stormwater runoff enters the Filterra system through a curb-inlet opening and flows through a specially designed filter media mixture contained in a landscaped modular container. The filter media captures and immobilizes pollutants; some of these pollutants are then decomposed, volatilized and incorporated into the biomass of the Filterra system’s micro/macro fauna and flora. 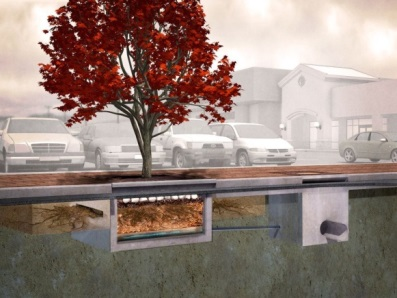 Stormwater runoff flows through the media and into an underdrain system at the bottom of the container, where the treated water is discharged. (typical 1.3 m) and most flexible design. At the heart of the Filterra system is Filterra engineered biofiltration media; a specified gradation of washed aggregate and organic material homogeneously blended under strict quality controlled conditions. Using data from independent, third-party studies including the University of Virginia (TARP), Herrera Environmental Consultants (TAPE), Terraphase Engineering (NJCAT), North Carolina State University (TAPE & TARP) and Geosyntec Consultants, the filter media has been optimized to operate under high flow rates while maintaining pollutant removal performance. Filterra media is tested for hydraulic functionality, fertility, and particle size distribution to ensure uniform performance. Filterra media also supports a vegetation component with suitable hardiness for the local region consisting of grasses, shrubs, or trees that assist with the adsorption of pollutants with biological uptake/storage and pollutant consumption by microbes within the plant root zone. Information above is based on results from third party field studies following industry recognized protocols such as TAPE and TARP. Relevant studies are noted for each pollutant, and corresponding data was aggregated to provide realistic and repeatable performance expectations. Vegetation selection guidance based on your climate zone and salt tolerance. 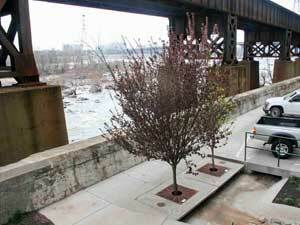 On-site planting and activation included with every system. 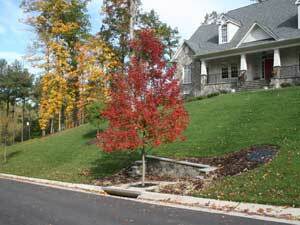 The first year of maintenance is included with the purchase of every system. 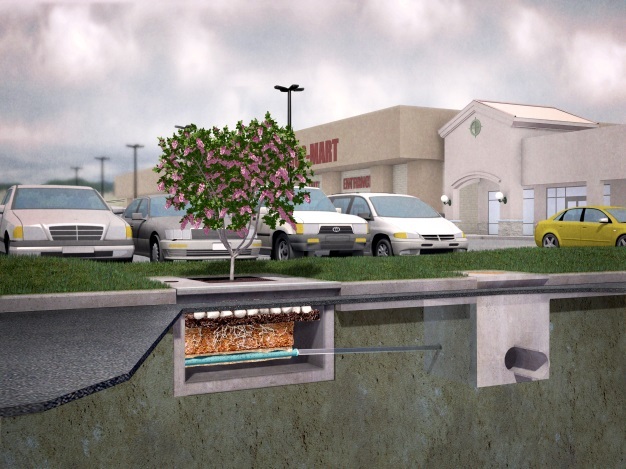 - No confined space entry required, everything can be accessed from the surface. 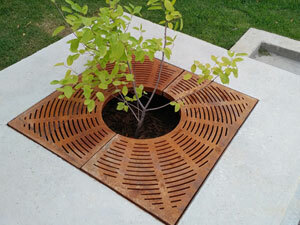 - Clean biofiltration bay with simple landscape tools (rake and shovel). 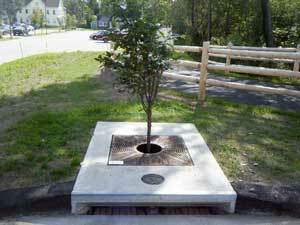 Bioretention systems such as Filterra rely on the vegetation to assist in pollutant removal. 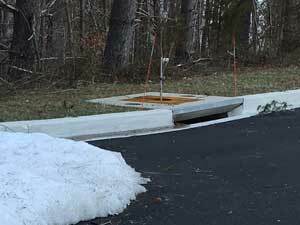 Winter road clearing efforts can wreak havoc on roadside landscaping and stormwater structures. 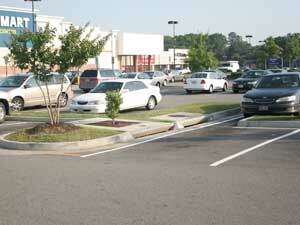 Filterra is offered in multiple configurations to meet site specific needs. 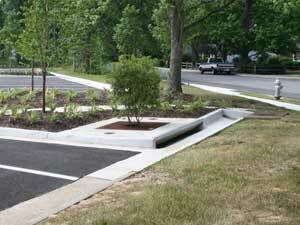 These configurations make Filterra a versatile yet effective stormwater BMP with a low life-cycle cost. The Filterra Standard Offline configuration is the most economical and simplest Filterra configuration. It utilizes a downstream catchbasin or curb inlet for bypass flows allowing for the shallowest profile and most flexible design of any of the Filterra configurations. It is ideal for both new and retrofit projects. 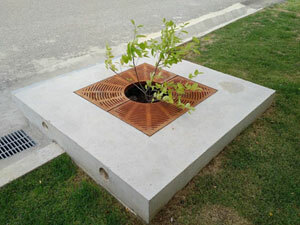 The Filterra Street Tree contains openings in the concrete vessel for root expansion of trees with larger root balls. 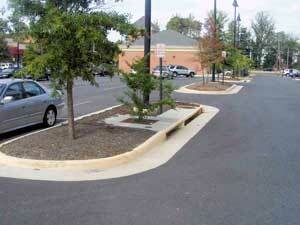 Filterra recessed tops allow a seamless integration using pavers, Mulch, or sod. Recessed tops increase the depth of the invert out. 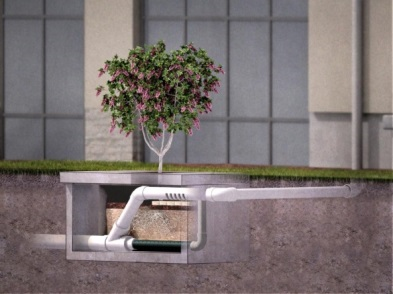 The Filterra Internal Bypass – Pipe treats stormwater runoff from rooftops or other sub-grade sources such as area drains. Higher flows bypass the biofiltration treatment system via an overflow/bypass pipe design.